Exercise not only plays a substantial role in the development of bone mass during childhood and adolescence, it also enhances balance, motor skills and coordination. A healthy lifestyle has positive psychological effects as well: improving feelings of leadership, respect, discipline, creativity and confidence. So how do we get our kids excited about moving? Exercise does not have to be just about running laps and lifting weights. Our best tip? Find exercise in disguise. It’s the same concept as adding mashed zucchini into those muffins; what they don’t know won’t hurt them - it will make them stronger! It can be difficult to find time at the end of a busy day, but a family walk after dinner is a great way to connect with your kids and a simple way to introduce healthy choices to young children. Encourage a game of freeze tag in the basement, “Simon Says” with fun exercise moves, or jump rope. Sport&Health even offers classes especially for kids, like Tumble Tots, Zumbatomic, and Kids in Motion. To children, these classes seem like nothing more than a great time to play around and have fun. Check out our programs online. One of the most important things we can do is lead by example. Every adult can be a role model, whether you're a parent, caregiver or teacher. Our children are impressionable at a young age, and they learn by what they see. Do my kids still love cookies? Yes. Do I have trouble getting them to eat their vegetables? Absolutely. But they are also fully encouraged to dance along with me in the kitchen while I make dinner. 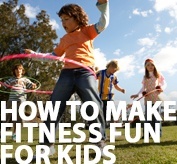 So find a fun way to fit fitness into every day! Jeannie Monroe is a Group Fitness Instructor with Sport&Health and mother to three children.